In this passage we see one of the more famous stories in all the Bible. Jesus calms the sea. This is one of those stories that we’ll unpack more next week, it says that they were going across to the other side of the sea. They were going to get away, people back didn’t cross over to other side. Why? Come back Monday and find out. We see in this passage that they set out and a storm blew up. Now this is not surprising, storms blow up all the time on the Sea of Galilee. But this was one was fierce. 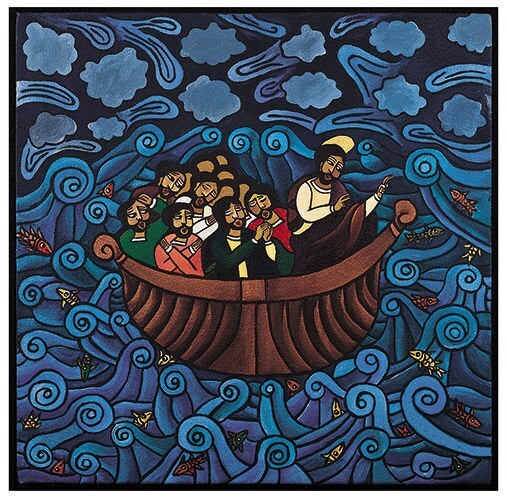 So fierce that these disciples, many of whom were fishermen and used to storms like this, we scared. And their question to Jesus, to me, shows the depth of what fear can do. Look what they ask. “Teacher, do you not care that we are perishing.” Look at all that Jesus had done, already. Look how He has called them by name. Look at how He has appointed them. Look at how He has healed so many already. Look at what He has done. Of course He cared. Of course He loved them. Or course He would take care of them. But you know what? Fear makes you forget these things. Fear makes you question. Fear makes you doubt. Fear takes your trust. Think about how many times we have chosen wrong or doubted what we know to be true, based off of fear. And what does Jesus do? He speaks and brings calm. He speaks and brings calm. Sometimes when we read the Bible there is great need in knowing the Greek and the Hebrew and all the context of everything. Sometimes it is this. Listen to Jesus speak calm to your fear and your storm. He loves you today. He really does. He loves you. He will not forsake you. He cares. Don’t be afraid. Not that there aren’t big things out there. But don’t be afraid. Jesus has not left, not will He leave. He cares for you today. Nothing is better than that. And they were amazed that even the wind and the sea obey. All things obey for He is Lord of all. Don’t forget that. They were really afraid. And they questioned if Jesus cared for them. They knew that Jesus loved. Fear made them doubt. Monday we’ll look at Mark 5:1-19. What questions do you have? How does this strike you? Shoot me an email, comment below, or connect with me through social media.